LAiMER. Nutwood necklace, black faceted Swarovski stone with gold plated silver chain 60cm. The wood used to make this necklace is FSC certified. 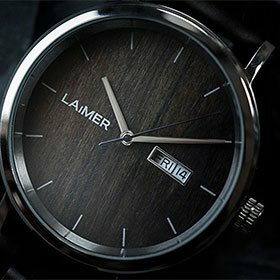 It means that no tree needs to be cut down to manufacture this lovely necklace because LAiMER only uses residual wood from furniture industry.